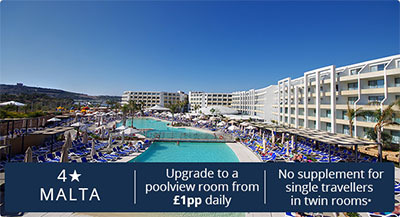 Set at the edge of one of Malta's most popular sandy beaches, the Seabank Resort and Spa affords fabulous views out over Mellieha Bay. It's a perfect spot from which to settle into the country and begin to enjoy your laidback holiday lifestyle. Mellieha has so much to offer. It's a quiet, pretty part of Malta, but gives easy access to the bigger Bugibba and St Paul's resorts. The spectacular four star Seabank Resort and Spa is designed around holidaymakers' needs first and foremost. That is why the rooms are so spacious and light, giving you a truly relaxing space to call your own. Offering an excellent level of accommodation in spacious and modern rooms, the hotel also provides complimentary WI-FI throughout the whole resort. No matter how much of Malta you get to experience during your stay, you'll always want to make the most of the Seabank Resort and Spa's facilities too. The large freshwater pool, indoor pool and a paddling pool are all on site, and there is an amazing watersports and diving facility just over the road at the Lido. You can justify any lazy afternoon or evening after a light work-out in the hotel fitness centre, and do make sure you try the spa centre with its Jacuzzi and sauna. Oh, and just in case you don't get around to leaving the hotel all that much, there's evening entertainment too! Your stay in Mellieha will leave you feeling relaxed and revived, particularly if you're staying at the Seabank Resort and Spa. With all the benefits of its locations, its facilities and its views, it could just be the most relaxing holiday of your life. Breakfast, late breakfast, lunch, dinner and afternoon snacks including tea and coffee with cakes. Dine Around option with set menus available for evening meals at a choice of five speciality restaurants which must be booked in advance. Unlimited soft drinks, tea and coffee, wine and beer. Other alcoholic beverages served during bar opening times. (Time & measurement stipulations may apply).